Would you like flying to the skies on a hoverboard in Minecraft? Then pay attention to this mod. 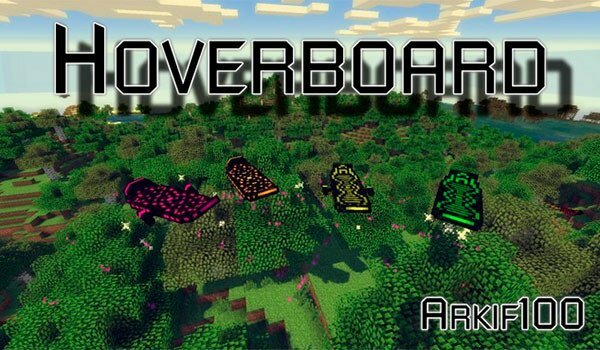 Arkif’s Hoverboard 1.7.10 is a mod that allows us a new means of transport to move through our worlds of Minecraft, a hoverboard. There are four different models of hoverboard we can create, a basic, one with rocket launcher, one with speed improvements, and finally one that combines the speed improvements to the rocket launcher. To start creating the hoverboards, we create a new crafting table. The hoverboards allow us to transport objects as if it were a chest. To fire the missile hoverboard you must press the “R” key. The hoverboards consume fuel and may even stop working if they reach a certain temperature, then they stop flying until cool. How to install Arkif’s Hoverboard Mod for Minecraft 1.7.10?